Reusing heirloom marble to make custom night stands. Recently a customer asked if I could salvage some heirloom marble that had been broken during a move. Recently a customer asked if I could salvage some heirloom marble that had been broken during a move. Reusing heirloom marble is possible. The marble was originally the top of a dining room buffet. A marble fabricator cut the marble into two pieces and molded the edges. 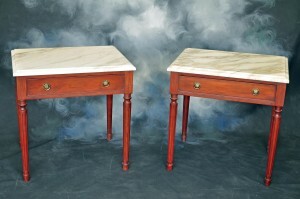 I then recreated two Sheraton style end tables using cherry. The legs were turned on the lathe by hand and also have flutes. The drawers were made from poplar and contain hand-cut dovetails. The color was a unique color blend created specifically for the project. The finish is lacquer.